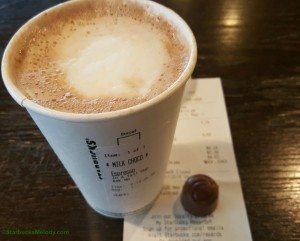 The Starbucks Melted Truffle Mocha is an elevated mocha beverage made by melting real truffles with hot espresso and milk. I first wrote about the Truffle Mocha in June 2015, as I stumbled upon it as a test item in a Juanita, Washington Starbucks. I just had the Melted Truffle Mocha again, this time in testing in Monroe, Washington. The fact that it’s still being tested is interesting for sure! There are two versions of the Melted Truffle Mocha that customers may choose from: Milk Chocolate Melted Truffle Mocha or Dark Chocolate Melted Truffle Mocha. These were delicious! The truffles melted well. The dark chocolate version was especially delicious as it didn’t taste like you were just drinking sugary-syrup mocha, rather it tested very chocolate-y. If I had to take a guess as to why Starbucks is testing an elevated mocha beverage, I’d say that it’s consistent with their desire to elevate the espresso beverage experience. 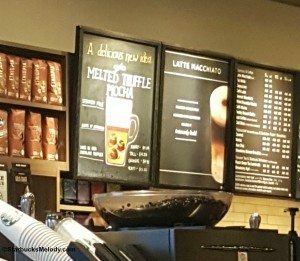 Starbucks has just recently (re)introduced the Latte Macchiatto into the beverage lineup as well as gaining a lot of success with the Flat White, including the wonderful Holiday Spice Flat White. I think the timing is right to put the spotlight on the Starbucks handcrafted mocha. I had posted a photo in a Facebook group, and mentioned that I was trying this new test beverage. One reader asked me: “When will the drink be available to get?” Because this is a test, you might never be able to get this drink. There’s a possibility that the Melted Truffle Mocha will never make it to a nationwide launch. Starbucks tests many more beverages than what actually ends up making it to a nationwide launch. In recent years, test beverages have included the Pumpkin Flat White, the Copacabana Beach Frappuccino, the Cherries Jubilee Mocha, the French Vanilla Custard Latte, and many more. I’m going to re-tell the story of the Pink Lime Frozt at Starbucks. In 2011, Starbucks experimented by testing (in a limited number of cities) the Pink Lime Frozt. In 2012, the Pink Lime Frozt went through a larger round of testing, including locations in California, Dallas, and Atlanta. And then after that, it was given the axe. It’s a good story because it follows a pattern of what Starbucks is known to do: test small and then expand to more cities as the company decides if the drink will logistically be possible and have wide-spread appeal. Texas, by the way, gets a lot of tests. 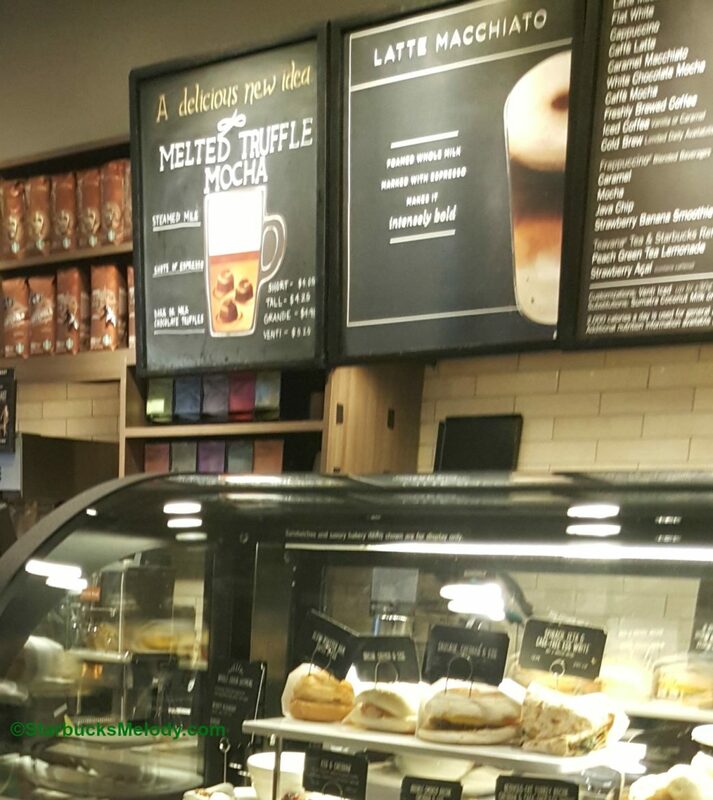 Recently the Starbucks Cream Puff was in testing in Texas. 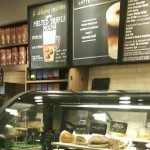 The conclusion is that if Starbucks is really interested in giving the Melted Truffle Mocha a go, the next place we should expect to see it would be some place like Texas, where Starbucks typically does a lot of testing of new products. If you see the Melted Truffle Mocha in a city near you, please snap a pic and send me your photo of this drink! For me, I’m giving this two thumbs up. I think Starbucks could sell the truffles separately too! Wow great article. It’s amazing how many drinks great created and no one ever gets to try it I can tell by the name that I’ll like it I don’t know if it’s just they way I think about it but it never fails if I like the drink name 9/10 times I love the drink. I really hope that the drink will make it to Albuquerque NM if it does I’ll snap the picture for you. Hope they test run it here in Carolina, I just love a new flavor, abs melted mocha truffle sounds like my kinda coffee, even over ice I’m sure would be delicious! Thanks for the heads up, I’ll be on the lookout, and will surely snap a pic of we are lucky enough to get them! This looks great! Since there have already been two rounds of testing (with a third coming up), I’m keeping my fingers crossed that this will soon come to a store near me, or even better…nationwide! A couple of people have wondered if they’ll find this drink near them – Do I have any Dallas readers? That’s a huge area of testing for Starbucks. Another big testing city is San Diego. Sounds delicious. I had something similar in a small coffee shop in Maryland. The had dark, milk, and white Belgian chocolate in containers that kept it at a constant temp and stirred. One of the most decadent mochas ever. Yummmm is love this to come as I feel like the current mocha can be chalky or flat. As a dark chocolate fan this has me excited. Actually, I am pleased to announce that Dallas is getting in on the Truffle Mocha test and we launch Feb. 15/16th, depending how whether stores begin selling early. Official launch is the 16th though. And I believe Minneapolis is also a site for this test! Sounds pretty delicious, though I manage we will have to stop partners from popping these truffles in our mouths when no one is looking! I had the dark chocolate truffle mocha on January 17th in San Diego. It was my birthday, and best mocha ever! So disappointed that I can’t find one now at my neighborhood SB. I’m gonna have to drive across town and hope they still have it. Shari I appreciate you comment. San Diego is a common testing grounds area for new drink innovation! If it’s been tested there, that is also a sign that it’s being primed for a larger test. I hope you can still get it soon. Looks like we’ll have to go to Texas to get it or Minneapolis given the comments above! They are launching Tuesday, 16 February 2016 in the Dallas area (at least). Cannot wait to try one. The truffles themselves were fantastic. Hello I just want to say I’m in Minnesota and my store currently has it. I’m very excited to try it. We were anticipating this drink at a store I work in in Wisconsin last week but it never materialized. Not sure what happened, it just seemed to dissapear. I love dark chocolate and have always wished that Starbucks would make a dark chocolate mocha. 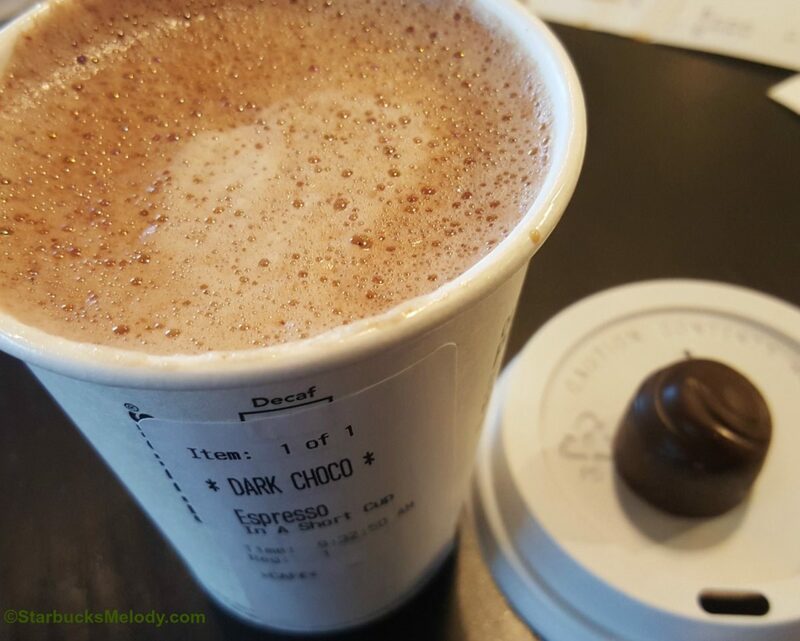 It’s one thing I miss about living in the Seattle area: At least two other coffee chains I used to frequent there have dark chocolate mochas but I don’t think they use truffles for theirs. Hopefully this test reaches northern California. I became an addict to the dark chocolate truffle melt while visiting my mom in Dallas. Returning to Atlanta I was delighted to find it here. ALAS it was apparently only available for Valentine’s season here, and my attempt last week to order one at my local Starbucks drew blank stares and comments from the staff that there ‘was no such drink’. Hope it comes back, or else I will have to result in making my own. The espresso whipped cream wouldn’t be regularly available, but the other ingredients might be. You’d have to check with your local store to know for sure. Anyone know if the truffle is back in WA…?